The Law of Ecocide: the extensive destruction, damage to or loss of ecosystem(s) of a given territory, whether by human agency or by other causes, to such an extent that peaceful enjoyment by the inhabitants of that territory has been severely diminished. 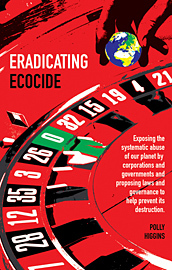 Polly Higgins’ book Eradicating Ecocide has been met with great enthusiasm since its publication in September. The author’s fellow environmentalists agree that her proposal to create a law against ecocide is necessary to put a stop to the systematic destruction of our planet, and most importantly they see it as feasible.